well-known headliner. His Elvis is a dead-on re-creation! ZZ Top "Viva Las Vegas" Principal MTV, VH-1, Warner Bros.
ALSO FEATURED on NBC-TV News, German and Japanese selevision specials and prime time programs. 20/20 Optical, and Dakota Smith Eyewear. Special Events Host for Walt Disney Golf Tournament - IBM, 3M, Polaroid, Acura, Gorton's Seafood, Pfiser, Radio Shack, and Digital. Frequent performances @ MGM Grand Hotel, Hard Rock Café, Imperial Palace, Caesars Palace, Mirage, Treasure Island, Bally's, Desert Inn, Cal-Neva-Lake Tahoe, Planet Hollywood, & Marriot World Resort. Family Feud special guest fund-raising show, won ten thousand dollars for the "Make a Wish Foundation."
? 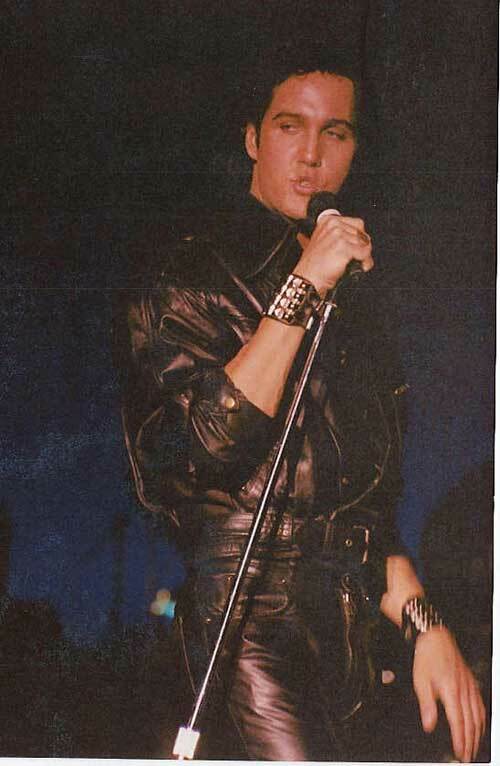 James as 'Elvis' ? 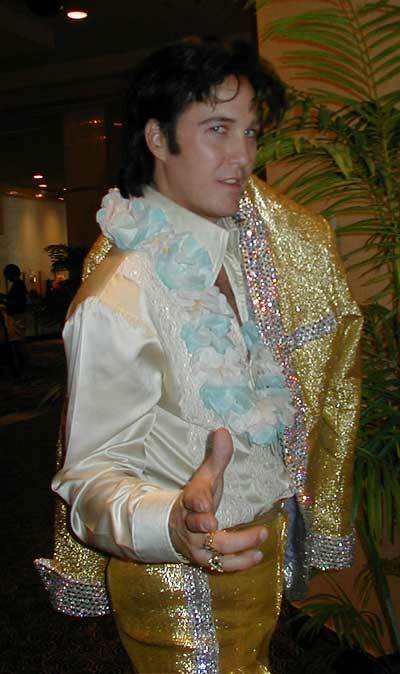 "In our opinion James is definitely the "BEST" Elvis in Las Vegas! Part of his charm is his fantastic wardrobe, which truly enhances his resemblance to the King of rock n' roll". "James is extremely easy-going and a pleasure to work with! James definitely values his clients and always goes above and beyond what is required to make sure that each individual person involved in the event is completely satisfied". "James is the best 'Elvis' around. He had the audience screaming in the aisles. He has the perfect look, an amazing singing voice, and the performance polish of a true professional. cooperative, always prepared, charming. His excellence is solid like a rock. What a joy!!" ". thank you for your ongoing good work at Bally's and Paris Las Vegas. Every function has been a great success due in large to your efforts. The combination of your singing abilities and outgoing personality creates a wonderful atmosphere for all of our convention guests". ". we enjoyed having you as "Elvis" in our booth during the Parker Seminars. Your performance was delightfully entertaining, and drew many more attendees to our booth than we could have ever wished for. Everyone who had the pleasure of visiting our booth and hearing you sing was extremely impressed with your spontaneity. that talent, coupled with the quality sound created by both your sound system and your vocal cords. We hope that you will agree to entertain us at the Parker Seminars for years to come!" "James is extremely easy-going and a charm to work with. He is not a premadonna, like many other performers. He clearly values his clients and does his best to deliver top-quality performance with a smile." "Your performance here at Fiesta Henderson, was electric, and simply put, "Fantastic, everyone raved". "Your talent and high energy absolutely captivated the audience and got many of them coming back again and again. .The time you took in the beginning to assist me with the promos and radio remote broadcasts were extremely valuable in promoting the general awareness of the show. You made the Elvis "sightings" around town fun for the business owners and radio stations and got the fans out to see you and take interest in coming to see the show at Fanny Hill. Your special performance at the Lakeside Nursing Home will always stick out in my mind. Observing the time you took with the residents, and the love and tenderness of your singing to them, brought tears to my eyes and a big smile to my face. It was very evident that you cared and it was a poignant moment for everyone in the room. You made them feel special. To me, that speaks volumes about who you are as a person and I felt fortunate to witness that. .It was clear that when you were performing you put your heart and soul into it. Your portrayal of Elvis was wonderful and very true to form. Your choice of songs, the voice, the moves and look was right on. You captured the audience's heart the moment they saw you on stage and I believe they really thought you were Elvis (if not - they wished you were). After the show, it was impressive that you took the time to meet and greet each member of the audience. .Our staff seemed to mirror the hard work and professionalism of your performance on stage". ".what a hit your performance as Elvis was.Your resemblance to Elvis, as well as your voice and mannerisms of "the King", is incredible! Thank you again for helping make our theme party such a success". 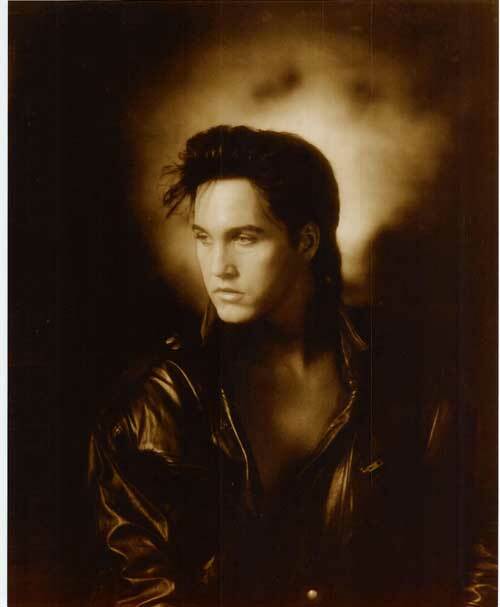 "The Elvis of my dreams!...his voice was perfect". "He looks like him, sounds like him.The crowd demanded an encore! This guy looks more like Elvis than Elvis.He's a great entertainer". "It's as if an Elvis movie has come to life.Jame's portrayal of Elvis is almost uncanny. With his blue eyes, black hair, and six foot stature, you find yourself almost believing the 'King' is back".